I've been tying tacking thread to branches. Several trees with distinctive bits hanging off have gone and pruned themselves (though it hasn't been windy) and I don't want to lose track of what's what. The thread is brown so it hardly shows and it'll break easily if a bird or a squirrel puts its foot in the loop. I've also been tying thread to trees next to the patches of ground I'll be observing through the year. 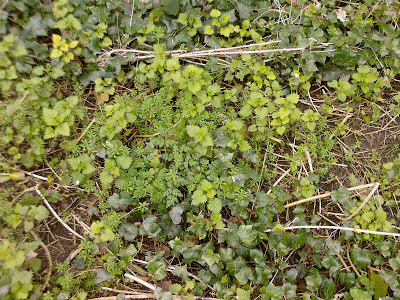 One patch of undergrowth looks much like the next bit along (until you look closely . . . and not always even then) and it'll get worse when summer comes. I've chosen six places to keep an eye on. Here are four of them. This is in a sunny spot. This is in damp woodland. .This is a woodland stream at the point when it breaks from shade to sunshine. 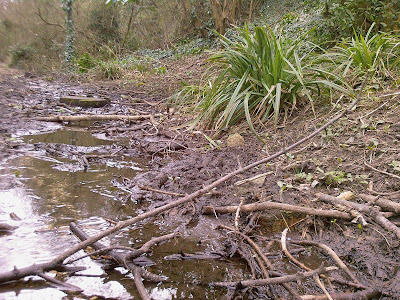 Watercress likes streams to be clear and fast flowing, not sluggish and muddy like this . . . but in previous years . 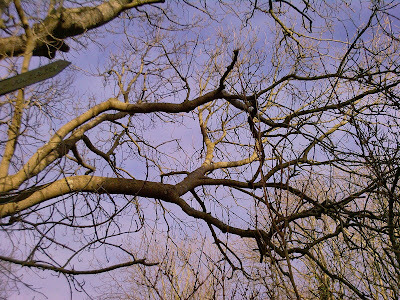 . .
And this faces east in deciduous woodland. In the winter it is light and airy. In the summer, it's in shade for the first part of the morning, then there's sun, then intense sun for the very middle of the day, then back to shade for the afternoon and evening. Blackthorn:- There's nothing changed in the bushes I introduced three weeks ago . 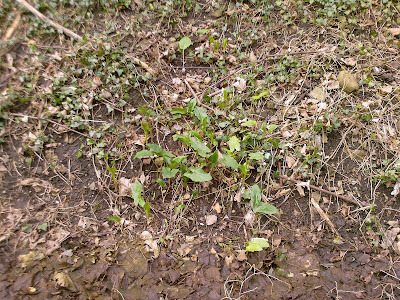 . .
but I found some on higher ground and in better light which already have substantial leaves. I'm surprised. Are they really blackthorn? 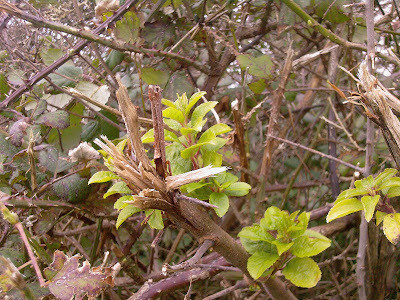 Blackthorn is supposed to come into flower before the leaves open. So . . . I tried Google images. 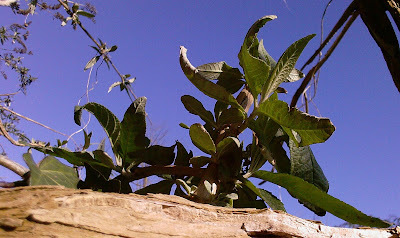 Mostly, the pictures were of mature leaves alongside sloes. Young leaves would be glossier and more curly edged so I typed in 'Blackthorn Leaves in February' - and was directed to the blackthorn post here, on Loose and Leafy. Well, that's not much help. Quite apart from there being no leaves on that blackthorn - I don't know what I'm talking about. I'm the one who needs information. What responsibility! What a reminder not to take the internet seriously! Don't! And now, back to witches. It may be the elderberry and blackthorn; the oak and the may. I don't know. But something is attracting witches to Loose and Leafy. Welcome, witches . . . at least, welcome to the good ones. I don't know anything about witchery. I don't know much about being a pagan either. But I do know there are people who love goodness - and others who are drawn to evil. I'm glad when people read Loose and Leafy and ever so pleased when they like it and it's really nice when people put their followers' icons here too. BUT . . . if I think the icon will lead readers (or me) to things I believe to be sinister or unwholesome I will feel bound to put up a block. Having said that, I acknowledge I'm an ignoramus about most things so if you put your icon here and I've blocked it and you think I've made a mistake - that I've misunderstood you or your blog . . . email and I'll look again. I've always considered blackthorn to be a mysterious and enigmatic plant and have loved it from childhood. The gnarled twigginess of an ancient blackthorn hedge is loaded with gnomish or elfin magic; the blossom, always arriving around a spring cold spell is more understated than its swanky cousin, the hawthorn, but still enchants us because it is so early. Also, blackthorn has a complete mind of its own, about when it will flower. (I've spotted it as early as January and as late as May.) How could there not be witches, when there is blackthorn around? Even the Latin name, Prunus spinosa, is redolent of Chicago gangsterism. Your blog is fantastic for making us think! You see things differently and that's great for stimulating thought. Oh! I never thought about there might be followers on my blog that weren't pure and good. Now I guess I should go check out all of them. You say there is a way to block those, I guess I can figure it out. Meanwhile, I like following your chosen locations to visit from time to time. I feel as if I am "out and about" with you. I thought of becoming a witch once... but didn't FOLLOW through. Too much hocus pocus, really. word verification is misting. I like it. You mention the Latin name . . .
Until I was took the photograph for this post, I'd associated Blackthorn with Hawthorn, thought they belonged to the same species and hadn't taken any notice of blackthorn leaves - so I was surprised when they looked prunus-y instead of hawthorn-y. Given that there are damsons further along, I thought I'd better check. In one way, it shows how useful it is to know the Latin names. In another, it shows how one can often trust the plant to tell you itself . . . if only one looks! Barbee - I do think it is worth checking who is following your blog - in part because you can come across some interesting bloggers that way but also because it's good to know with whom one is being associated. If you want to block someone, or easily to see more about them . . . go to the top right hand corner of your dashboard where it says how many followers you have. Click 'followers' there . . . and you get a list with icons. Click an icon and you get to see details of that person and the opportunity to block them if you so wish. This doesn't block them from visiting or commenting on your blog, so it isn't really blocking . . . but it means their icon no longer shows. I'm glad you like taking a look at the twigs and patches of ground I am following. I hadn't realised before how gripping this precise kind of observation can be. When I wrote this post, I was torn. I know I find it fascinating to see what comes up where - but I wasn't sure it would be quite as exciting for my readers . . . which is why I only put four patches on this post. I sense it will be an emotional journey though because at least some of these patches will be mown down during the course of the year. Well, Monica . . . what with the cats . . .
Hello Frances - how nice to have 'Misting' for your word verification. Quite a few nice ones turn up since Google introduced more and vowels and a better distribution. I had 'unfoe' earlier today and I think that should be incorporated into our vocabulary. Sometimes they come out like names for science fiction monsters too. About the threads and 'pruning' . . . this all started when our local council flailed the bushes in September (slashed at the bushes with a big machine to trim them back). I was distressed at the time because they had taken things back so far that they had split the ends from some quite mature branches. Nigel (who also has commented on this post) also raised the issue of hedgerow flailing on one of his posts . . . not only is there the question of whether it's good for the bushes but also of how it affects birds. It is an emotive issue, not least because flailed hedgerows look so awful but I thought it would be good to see what continuing impact flailing has . . . so I chose some flailed branches to follow through the year. It sort of expanded from there. The council mows the ground in front of the hedges too. Over the years, I've tended to think this continual chopping down means plants like Queen Anne's Lace have learnt not to grow as tall as they used to, that's how it seems - but I don't really know . . . and, apart from that, it probably doesn't matter. None the less, having started following specific branches, I thought it would be interesting to follow specific patches of ground as well. Anway . . . that's why I'm tying bits of cotton . . . Hoping you may find all this interesting too. P.S. I promised Monica I'd see if I could photograph the flailing machine when next it comes by, so stand by for Loose and Leafy turning mechanical . . . ! Thank you for the help, Lucy. 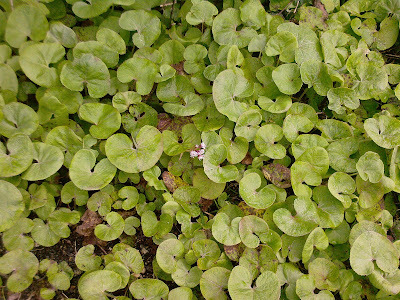 Hi Lucy, One of those photos is an area full of wild violets. My backyard is becoming covered with them, and although they're pretty when flowering, they are taking over and have very deep and strong roots. I put in just a few from a neighbors woodland garden, but ended up with more than I bargained for. It's been about 10 yrs...and they have multiplied by the dozens!